My chow is about 10 weeks old. I got him when he was at least 7 weeks and his breeder was feeding him pedigree wet food. I got him dry food to eat, but he does not really eat it or like it. I then got him to get use to eating eggs and I would add a little meat every now and then or even some fish. Now he seems to mostly like to eat meat and wanting to eat meaty food. He does not like any of the dry food I got him or he does not really like his wet food. Does anyone have any advice or can help me figure out what type of food is good for him and what type of food he would eat? It seems like he mostly like chicken, but I read chicken is not really good for him, or is it that he should not be eating a lot of chicken? I just need help trying to feed him the right amount of food and what kind of food because his poop looks like diarrhea and it does not seem healthy for him. There are a lot of good articles here on the forum. Chows seem to be picky eater. I feed Simba Pedigree dry food soaked in some water, until Vet suspected food allergy. So I changed to Royal Canin for sensitive skin and avoided all food with grains, specially wheat. I feed him now and then Pedigree "homestyle" or Whiskas "tuna" cat food. So high protein, no grains, but fibres. I give him some fruits here and then, he like apples without seeds and boiled eggs. Next step, is to feed him a mixture of rice, with a bone/meat mixture called "saw dust" I'm getting from our local supermarket. The "saw dust" is what they collect if they cut the meats into portions using butcher saws. He loves it. So far no negative reaction of skin, or digestive system, but too early to say this is going to be his final diet. Until now I'm mixing it with his royal canin kibbles. Oh, I also mix fish oil with minerals and vitamins in his food, one teaspoon per day. 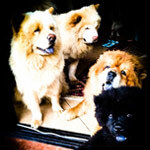 There are a lot of Chow owners here more experience with diet. Simba is only eight months. Thank you for your helpful tip. Do you suggest I should just leave him his dog food out until he eats it? I feel like he does not eat his dog food or will not eat it. I want him to get into the habit of eating it along with a few things like eggs, fish, and rice. What helpful tips can you or anyone else give me for him to eat his dog food now that he is already use to eating normal food like chicken and beef. You have to find out what he likes and doesn't upset his skin and /or stomach. With respect to leaving food, there are two schools. 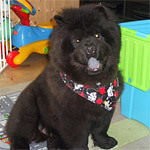 Chows are responsible eaters normally, so overfeeding risk is mimimal, if leaving food all time. But like in my case (living in the tropics) I'm afraid of spoiled food or insects laying eggs etc. So I don't leave food with him for long (maybe 15 to 20min). Simba is a picky eater too, every time we change food, he goes for what he knows first to the extend that he spits food containing unwanted parts on the floor and sorts them for parts he likes and he doesn't. I consider it again as display of his intelligence and took up the task to provide food he likes and which is good for him. This is a longtime "project" and I'm still not sure if I hit it with his latest diet, rice with meat/bone mixture. for snacks apples. Will add eggs, yoghurt, cottage cheese if current food doesn't give new allergic reaction. I'm one week in it and one day w/o antibiotics. When I change I always add just some of the new ingredients into the old diet to get him used to it. He's a Chow! If he's decided he only wants wet food, there's no way to change his mind! Get him a high quality wet food and watch him eat like a madman! That's what I did. I was so sick of worrying about Loo's food intake that I threw in the towel and bought him what he wanted. Chows have perfected the art of the hunger strike. 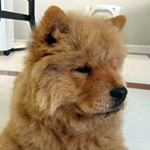 If your chow is picky, consider the palatability of the dogfood you are offering. Dont leave it out for her all day as she is bound to be sick with its scent all day and of course lose her appetite for that specific dogfood. 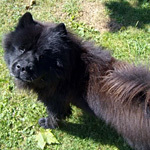 Wet or dry or mixed does not matter as long as your chow finds the scent attractive. If not, she won't eat it unless starving that she needs to eat a little from that "horrible" food you are offering in order to survive. They are picky eaters really but it'll go away. IMportant thing is to feed her food she's eat. I find cottage cheese a bit high end and I wont be giving it in regular amounts because it is expensive. Morsels of meat cooked with some soup will be much acceptable and enjoyable and they get their fill more if combined with kibble. Hi.. My chow sometimes don't eat for a day. And he seems to be tired of vitality puppy. He's 7 months old and I tried squash, he doesn't seem to like it. I tried eggs he does but is it ok to feed him eggs everyday? Please help. At last, I bought her super premium food and she ate it the first two times, but then again didn't want it anymore, I almost cried out of frustration! I read a bit about this problem on internet and saw this tip where you stop doing what you dog wants, stop caring. Just offers its food twice a day, no expression on your face, no begging, don't say anything, just leave it for about 20 min and if it doesn't eat it, you take it, again, no expression, and just offers again at next feeding time. One day and a half of refusing to eat, she finally gave up and went back to eating dry healthy food again. So relieved. Chows really know how to train their owners, be careful with that. It is very important to find a good dog food to keep your dog healthy. Do your research and find out what is in the different brands. For instance Pedigree has corn, meat and bone meal, corn meal, ground fat, ground fat, chicken by product meal, ect. Ingredients are listed in the order of amount in the food. So Pedigree has more corn than anything else. Compare to Merrick food, chicken, chicken meal, turkey meal, brown rice, peas, barley, ect. Which food would be better for your dog? You can do a search for "best dog food" and find out all kinds of information. Hi guys, i have a four months old chow and he became a picky eater. He doesn't eat the usual food i serve which is beef pro. Then i decided to buy a pedigree puppy dry food. But he seldom eat. I try to give him a pedigree in can. I guess he likes it. On the other hand i also give him a variety of mixed food such as rice with soup and a bit of pork. I want him to grow healthy. So i need your suggestions please. Chance went thru a very picky stage. I switched him to one meal a day. Now he scarfs whatever I put down for him. I tried going back to two meals and he quickly became picky again as he was not as hungry at meal time when I split up the food. I give my 3-month old chow cooked chicken once a week, I put it as a food topper and he likes it so much. Mine's a picky eater as well but he goes well with eukanuba.